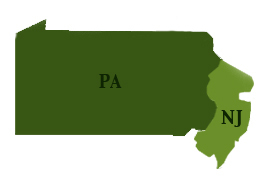 Named for the nearby Delaware River, Pennsylvania's Delaware County is fondly known as Delco. It's located just southwest of Philadelphia and is home to nearly a dozen colleges and universities, 49 municipalities, countless historic sites and museums, and plenty of parks and nature areas. Residents enjoy seasons that range from cold, snowy winters to humid, sticky summers. Regrettably, people aren't the only ones who find Delaware County a pleasant place to live. Many pests, who are drawn by the plentiful opportunities to seize shelter, food, and water, also call the area home. Eliminating these pests often requires professional assistance, and DB Pest Solutions is ready to help. Carpenter ants. While they do not eat wood like termites, carpenter ants do tunnel through it as they build nests, and their activity can cause extensive property damage. Pavement ants. Fond of nesting beneath sidewalks, concrete slabs, and basement walls, pavement ants can compromise foundations as they dig to build their nests. Pharaoh ants. Linked to the spread of several diseases, pharaoh ants will scatter if their colony is threatened, but disturbing a colony doesn't get rid of these ants. Instead, it leads to the creation of several smaller colonies. Red imported fire ants. Like other fire ants, these pests have a painful bite that can trigger fatal allergic reactions. Thankfully, most bites are not that severe. Odorous house ants. Persistent pests that thrive on sugar and grease, odorous house ants are often found in kitchens. Bed bugs are stealthy blood suckers that infiltrate homes and businesses by hitchhiking in on bags, boxes, shoes and clothing. They lurk in hidden spaces near the places where people rest and emerge at night to feast on sleeping humans. As they retreat, they leave behind itchy, red bites. The presence of bed bugs is not an indication of poor hygiene or bad housekeeping; sadly, anyone can fall victim to these pests. Indicators of a possible infestation include specks of blood on the sheets, sightings of live or dead bed bugs, and unexplained insect bites. Termites do not sting or make noise. Instead, they search out sources of cellulose like damp wood and consume it voraciously. Their appetite for wood means that these insects can cause a great deal of destruction and structural damage to a commercial or residential property, and they often go unnoticed until the damage is extensive. Because termites are so easy to overlook, the best way to protect your property is to have it inspected by an experienced pest control company. If ants, bed bugs, termites or other pests are causing problems at your commercial or residential property in Delaware County, don't waste time. Protecting families, homes, and businesses for more than 35 years, DB Pest Solutions has the expertise necessary to assist you with all of your pest control needs. We offer both residential and commercial pest control services, and our highly trained technicians can create effective, customized plans that suit your unique needs. Contact DB Pest Solutions today to learn more about our services or schedule an appointment.